Recently at Carson, it was low tide and the sand looked like it would be amazing to do some sand raking on. So we brought out the four sand rakes, and I ended up participating with the children. 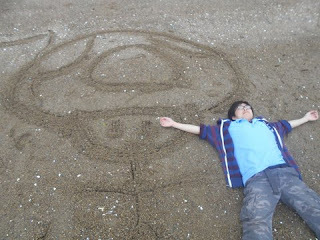 I enjoyed making the mushroom from Mario and I also added a stick figure body to him. Here's a photo of me lying next to my mushroom head, proud of my creation. While I was making my artwork, one of the rakes broke (not me, a child did it). And then another was getting loose, which was an easy fix. 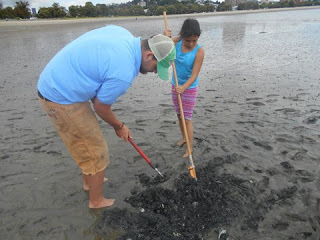 Then the kids started using the rakes to dig a little pond and a pathway down to the ocean. They were seeing if they could put more water in and watch it go from the "pond" back into the ocean. Here's a picture of Joe and one of the kids digging a hole with the sand rakes.